44 acres southeast of the Olympia Regional Airport along the Deschutes River. A conservation easement on the property was donated by Rich and Sharon Stewart in 1994. This property is primarily a riparian corridor ecosystem, including wetlands, uplands, old meander channels, and extensive second-growth forest. About 0.75 miles of the Deschutes River runs through the property, bringing with it seasonal runs of salmonids. The woods bordering the river contain not only a diverse combination of native coniferous and deciduous trees, but also red-osier, Pacific dogwood, red elderberry and Indian plum. This forest and riparian ecosystem provide habitat for cedar waxwings, bald eagle, pileated woodpecker, mourning dove, Northern rough-wing swallow, kingfisher, brown creeper and turkey vulture, not to mention all of the amphibians and invertebrates living in the stream itself. Barb and Pete Ockfen moved to their small farm on the Deschutes River in 1925. Their son Ken was born on the farm the same year. The family worked on the farm and slowly developed a small dairy herd of 25 Jerseys. They were largely self-sufficient and it was a good life. I was five years old when I first went to the farm to visit my aunt, uncle and cousin. It was to be my second home. I loved being outdoors–doing farm chores, milking, haying, or hoeing corn in the “Drudge Patch” as I called it. There was always something to do, and Barb and Pete had a knack for making it enjoyable. There were able to bring out the best in people. After a long day of haying–this was before hay balers–we would jump in the river to cool off and settle the dust. Then we would check the crawdad traps and head for the barn and the evening milking. About once a week, usually after summer morning milkings, Ken and I would spend a hour throwing buckets of water at each other. Along about dark, Pete and I would go down to the river and nightfish for cutthroat trout. I can still smell the smoke form Uncle Pete’s cigar as we sat on the riverbank fishing in the moonlight. About 10:30pm we would take out the catch and head for the milk barn. The mice were active at night and with several wire-haired terriers helping, we would storm the barn–cutting off escape routes, laughing, and generally having a good time. It may sound strange reminiscing about chasing mice in the milk barn, but it was great fun! The Ockfens were able to make a living milking 23 Jerseys. They did this for years and I was lucky to be a part of it. It seemed everyone who spent time on the farm developed the same love for the lifestyle and the beautiful surroundings. The cows were sold in 1963 but the Ockfens, semi-retired, stayed on. Pete used to say there was no place he’d rather be than on the farm, and nothing he’d rather be doing than working there. So the Ockfens retired to the farm where they spent most of their lives. In the late 1970’s, Debbie and Mel Low became neighbors on the farm and helped with all the chores. The farm would not be what it is today without their contributions. Gradually, the influx of people in the Northwest was becoming apparent, even in our secluded area. The tremendous salmon runs up the Deschutes were declining. There were fewer crawfish, fewer nighthawks in the summer evenings, and meadow larks were disappearing. These were almost imperceptible changes, but the old-timers could sense it. The Ockfens wanted to shield the farm form these changes. When Pete was in his early 80s he said that eventually the entire area would be covered with houses, regardless of what we did. Then in 1985, 44 acres of adjacent forest on the Deschutes River came up for sale. We knew the property well and bought it. Except for plowing five acres of thistle and turning it into pasture, the area has remained as it was. Some of the broad-leafed maples are over 150 years old. Trilliums, Oregon grape, salal, and maidenhair fern abound. Western red cedar, white fir, immature Douglas-fir, ash and cottonwood make up most of the trees. Black-tailed deer, beaver, raccoon, skunk, opossum and coyotes are inhabitants. As the area continues to grow, property taxes have increased. I was told it would be very difficult to have the property classified as open space. Then I learned about the Capitol Land Trust and their program of conservation easements designed to protect natural areas. I talked with Stu Martin and Bruce Turcott from the Trust. 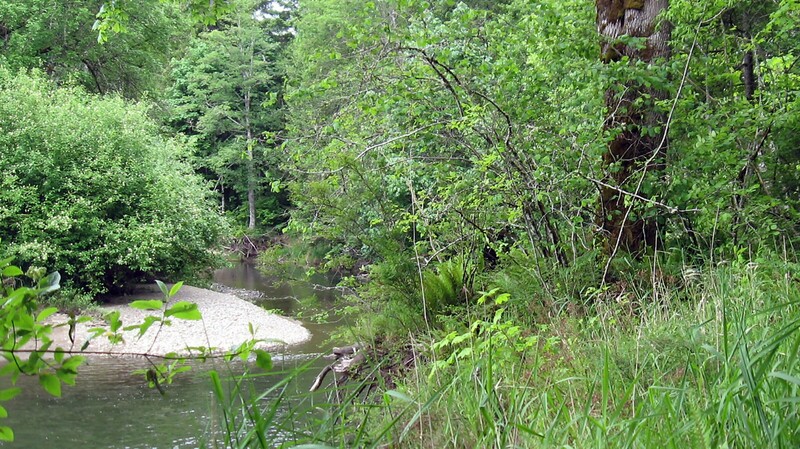 With their help, we were able to protect the land from logging and development with a conservation easement. Now the land will remain in its natural state. Pete Ockfen did not live to see the 44 acres protected. He died in 1992 at the age of 92. Barb and Pete had been married over 70 years, and with their son Ken lived on the Deschutes for over 65 years. Barb is now 96 and still lives on the farm with Ken. They live the simple, honest lives of farmers and they love the land. The preservation of this Deschutes River forest is dedicated to Barb, Pete and Ken Ockfen.